Shopping in Branson can be enjoyed always by visitors who are spending a wonderful time by visiting flea markets and many other interesting spots in this vacation paradise. As you try to roam around the historic downtown Branson, you can pass through old streets, vintage buildings and nostalgic themed shops that are filled with many good buys and a lot of merchandise that Branson has to offer. In the historic downtown Branson, you can have a glimpse of its beginnings in the budding Ozarks. Shopping in Branson is a good opportunity for visitors to find great items in the flea markets. Some of the flea markets that you can find around Branson include the Main Street Flea Market, Coffeit's Flea Market & Craft Village, Cadwell's Flea Market, and the Picker’s Flea Market & Country Store. The Main Street Flea Market in downtown Branson is a great place to find hidden treasures that can catch the eyes of any collector. This flea market has lots of vintage stocked booths for you to browse and features a variety of stuff to look at. This shopping spot has a nice mix of antiques and junk. Main Street Flea Market comprises of small stalls that are jam-packed with many kinds of antiques. Coffeit’s Flea Market & Craft Village is a seasonal market that starts to open from May through October from 9 am to 6 pm. This flea market features 40 permanent dealers that are located both indoors and outdoors plus 40 to 100 vendors that are displaying their wares on a weekly basis. Many of the vendors feature collectibles, arts and crafts, and garage sale items. Caldwell’s Flea Market is another flea market in Branson located on the Main Street just before the Hilton at Branson Landing. They are open year-round, seven days a week from 9 am to 5:30 pm. This shopping place houses about 70 vendors with antiques and collectibles, books, toys, and new and used merchandise. 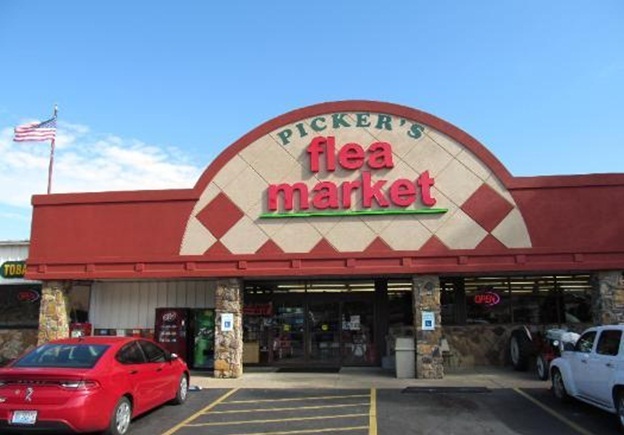 The Picker’s Flea Market & Country Store in Branson is home to about 80+ vendors displaying hundreds of items that are coming in daily. There is no limit to what the vendors bring in daily and open to display anything. This flea market is making sure that booths are accessible to everyone, well-stocked, and well-maintained. The vendor booths showcase a variety of items including home décor, sports items, fishing tackle, gears, primitives, collectibles and more. Shoppers in Branson love to visit Picker’s Flea Market because of its wide selection of antiques, Victorian, primitives, glassware, pottery, vintage jewelry, art and collectibles, accessories, lamps, shabby chic, metal signs, sterling silver jewelry, CDs, DVDs, die cast cars, quality used furniture, Amish goods, spices, seasonings, old-fashioned candy, jelly, jams, local honey, peanut brittle, and many more. Shoppers also love the wide aisles of the store and the easy accessibility to booths. So, if you want to experience a unique shopping in Branson, try to visit the flea markets in the Historic Downtown Branson where you can find many good buys.